I don’t know what I’m doing, you guys. I occasionally walk into wherever to meet my friends and say, “What uuuuuup!” while doing the raise-the-roof hand motion. I get stressed about silly things. I’m awful at most paper crafts. (I cut things out all jagged-like.) I sometimes doubt the stuff I’m baking when it takes too long to set… But you know what? 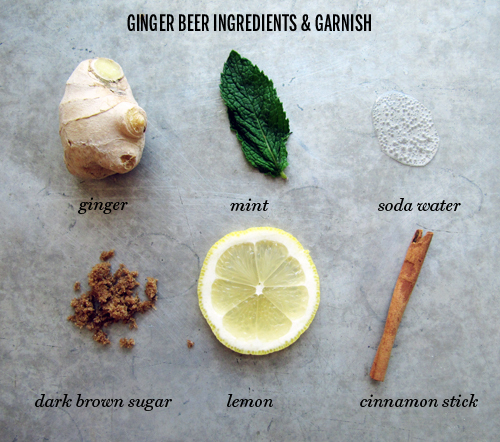 This ginger beer makes me feel like a super cool Hermione of sorts. It’s like a magical potion! And it tastes like carbonated zen. Relaxation in a tall classy way. It’s refreshing and so simple, that you’ll stop feeling anxious if only to pat yourself on the back because you made a drink! One worth loving. P.S. I leave tomorrow to visit my parents for Thanksgiving. I think it’s just what I need. I plan on napping and going out to breakfast. I can’t wait to wake up to coffee next to my bed and Home Alone on the TV. Hope your Thanksgiving is a magical one! 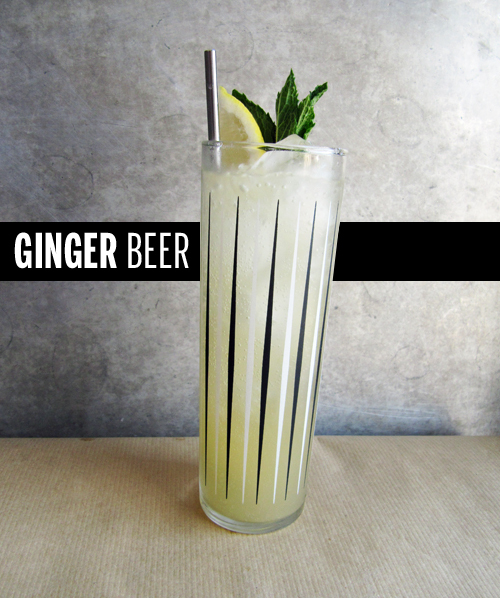 Make this ginger beer straight away! It’ll be ready just in time! Combine the ginger, sugar, lemon juice, and cinnamon stick in a jar. Stir until sugar dissolves. Add water, cover and chill for 4 days to allow the flavors to develop. Strain and divide between tall glasses with ice. 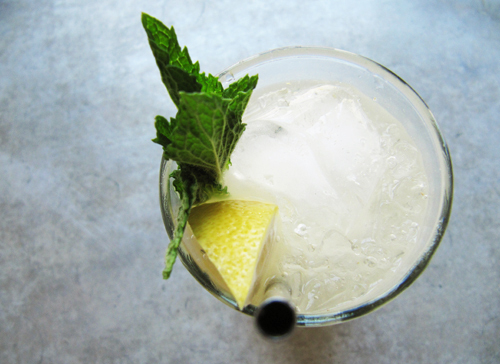 Add soda water to taste (a 4:1 ratio is about right), garnish with mint and a lemon wedge. Chug! Feel refreshed! 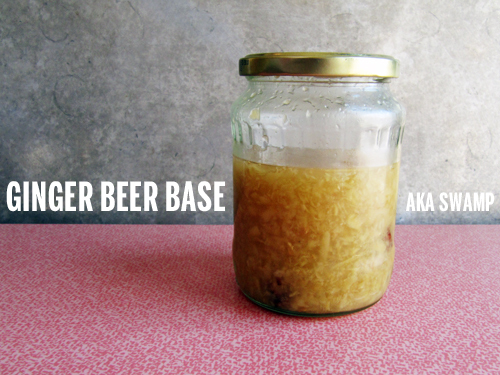 I put the base in a pickle jar. It’s far dreamier than it appears. I think this would be just the ticket for a Thanksgiving cocktail, right?! oh, dang! 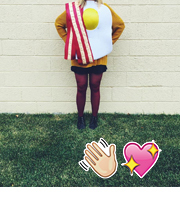 you’re like a beverage wizard…ain’t no drink-muggle, girl! I hope your thanksgiving trip is restorative and everything you need…get yo relax on! Totally not a muggle! ha! happy thanksgiving! hope you have a great time at home! i love napping on my parent’s couch with the fireplace on while christmas movies play in the background! amazing. Thanks girl! I totally napped the trip away. Get Relaxin’! I really need this in my life. right. away. ps I second Cindy’s Beverage Wizard Title. ha! Yes! And I can’t wait for our soup and salad date! Hooray! I can’t wait to see you in 2 days!!! How perfect. Next step – moscow mules. Thanks, Nicole! I totally need Home Alone in my life! I too make awkward hand motions when I’m trying to get a group PUMPED, especially if that group contains people younger than I. It’s really not okay. Anyway, this looks absolutely divine, and the perfect way to settle your stomach after indulging in a holiday feast. 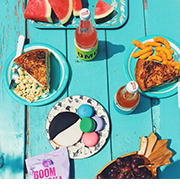 I especially like the way you included the soda water in your ingredients shot. So cheeky! haha Yeah, oh man. We need to get our hand motions in check!